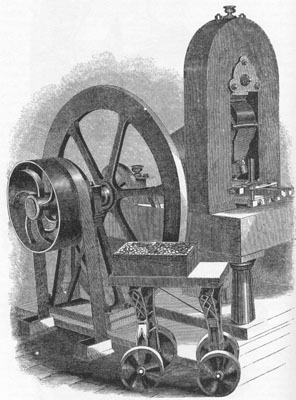 This is an engraving showing a three-quarters-view of the toggle-joint steam coining press designed by Franklin Peale and first used at the Philadelphia Mint in 1836. Presses of this type (believed to be the "small size") were used at the Dahlonega and Charlotte Mints. Power to turn the press was supplied by a belt from the steam engine. Source: Taxay, Don. The U. S. Mint and Coinage, An Illustrated History from 1776 to the Present . New York, NY: Arco Publishing Company, 1966, page 168.